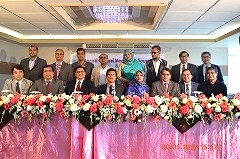 (20-21 January 2018) AMDA signed Memorandums of Understanding with both the Society of Laparoscopic Surgeons of Bangladesh (SLSB) and the Bangladesh Medical Association (BMA) to cooperate in the fields of medical education, disaster preparedness, emergency medical relief and rehabilitation medicine. The agreement has a three-fold purpose, namely, 1) launching an exchange program pertaining to medical education and collaborative research, 2) to have SLSB and BMA participate in AMDA Multi-national Medical Mission and Global Partnership for Sustainable Peace (GPSP), and 3) to seek other potential areas of cooperation. Currently headed by AMDA Bangladesh President Dr. Sardar A. Nayeem, SLSB has around 1,000 members who are mainly surgeons, gynecologists and urologists. As aspiring young doctors make up for 80% of the whole group, SLSB has been actively organizing workshops and academic conferences to foster the next generation of medical professionals. Dr. Nayeem’s encounter with laparoscopy dates back to when he came to study medicine in Japan as a Japanese government scholarship recipient. Around the time when he graduated Dhaka Medical College (MBBS) in 1985, it was more common for Bangladeshi postgraduates to pursue further education in the West. However, his father-in-law, a history professor at University of Dhaka, recommended Japan as his study-abroad destination. It made sense to him as he had always been impressed by Japan’s economic recovery after its defeat in WWII. All of this was long before emails and the Internet emerged. After his destination was set, Dr. Nayeem did everything he could to find the right medical expert under whom to serve his apprenticeship. He soon got in touch with Professor Yasuo Idezuki, one of the pioneers of laparoscopy in Japan. Although the professor did not know him personally, Dr. Nayeem kept in touch with him through exchanging letters. This eventually led him to studying at the University of Tokyo’s medical department. From 1987, Dr. Nayeem spent five and a half years at the university’s Second Department of Surgery where he honed his skills in laparoscopy. In 1991, he invited doctors from Bangladesh to observe the surgery at the university, and likewise, took a Japanese laparoscopy expert to his home country to demonstrate the techniques in front of Bangladeshi doctors. Gaining a lot of local media coverage, it was highly praised as “the dawn of new medical technology in Bangladesh”. In fact, this is what prompted the establishment of the Japan-Bangladesh Friendship Hospital (JBFH) in Dhaka. The hospital has been providing quality medical services for more than a quarter of a century, and has so far conducted roughly 25,000 laparoscopy examinations. Now, establishing partnership agreements with the two organizations is expected to contribute to the technical exchange between Bangladesh and Japan, and further enhance AMDA’s global disaster response network.